In this Example #1, let's say you want to look at a list of Purchase Receipts to see both the Date and Time that they were created. When you look at the regular Purchase Receipts (PO3020PL) inquiry screen in Acumatica, you can see the Created On Date, but not the Time. What if you want to add the Time to the Created On field? There is a trick. 1. 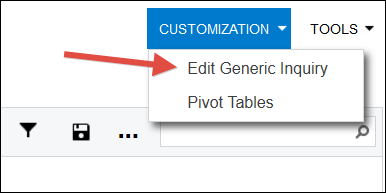 Go to CUSTOMIZATION -> Edit Generic Inquiry in the upper right-hand corner to edit the Generic Inquiry. 2. 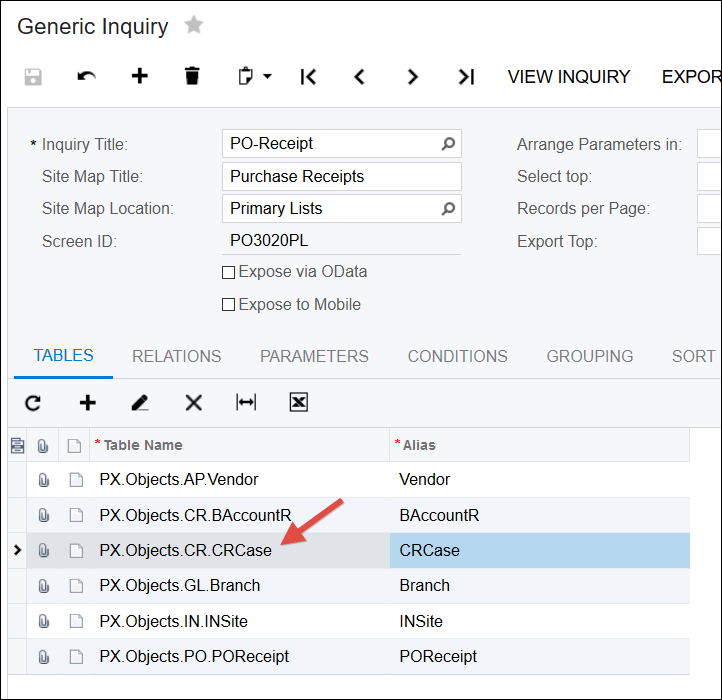 Add PX.Objects.CR.CRCase to the TABLES tab. The reason for this is that the POReceipt.CreatedDateTime Data Access Class in Acumatica is set to only display the Date, but the CRCase.CreatedDateTime Data Access Class is set to display both the Date and the Time. 3. Set the Schema Field column for the Created On field to CRCase.CreatedDateTime. The Schema Field column is only used for formatting/display purposes. We still want to show the POReceipt.CreatedDateTime value, but use the Data Access Class display format of CRCase.CreatedDateTime.